As my children push towards the big one-o, I find myself the only regular reader of picture books in our house (although my daughter still indulges me). As a result, looking at their books from just a few years ago sends me into paroxysms of nostalgic reverie. 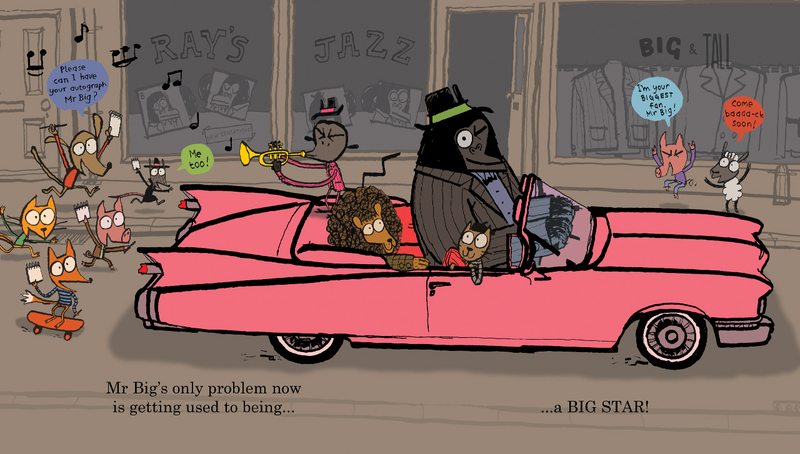 Amongst these treasures are two stories from the imagination of Ed Vere. First came Banana, a masterpiece of expressive comedy which contains just two words – ‘Banana’ and ‘Please’. It captures perfectly the anger, frustration and unfulfilled desires of children who aren’t yet able to form full sentences, but know very well what they want. 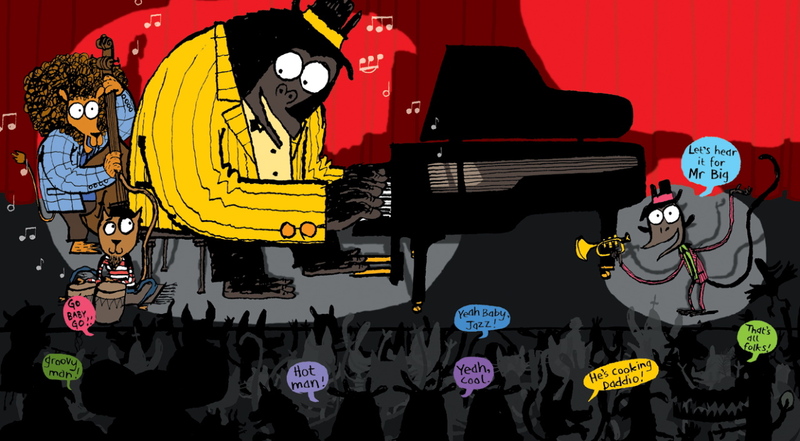 A little later we discovered Mr. Big, the jazzy gorilla who showed that sticking out in the crowd could be a very good thing. 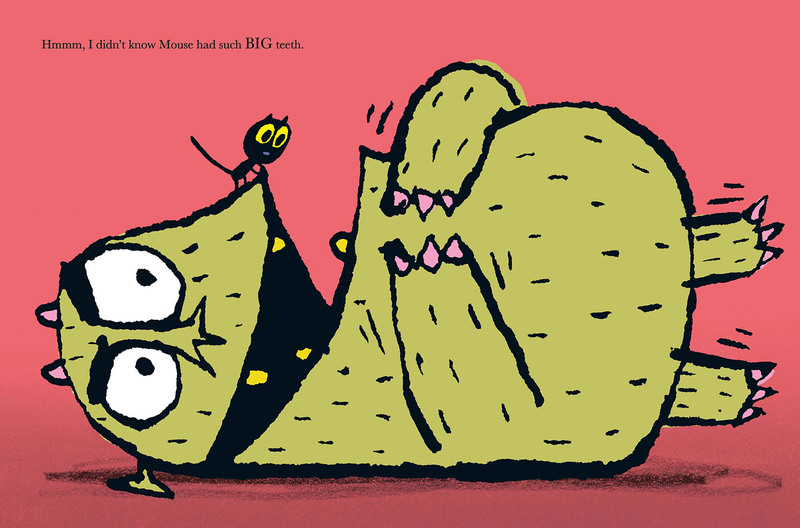 Now Ed Vere is back with a new series of picture books about a scrap of a black kitten first seen in Max the Brave. The sequel, Max at Night was published this month and follows Max as he turns superhero, fearlessly prowling the city at night. Ed’s picture books draw on classic comic book action and have bold graphic design elements, so I was interested to find out the books that shaped him as an author. I remember the tone of my father’s voice reading Hillaire Belloc and Edward Lear verses & Cautionary Tales… which I loved… as did he. He read them with relish and great theatricality. The Belloc, particularly, has a very teasing quality to it, which he was very good at capturing. He also liked making use of the pregnant pause… ramping up the anticipation. 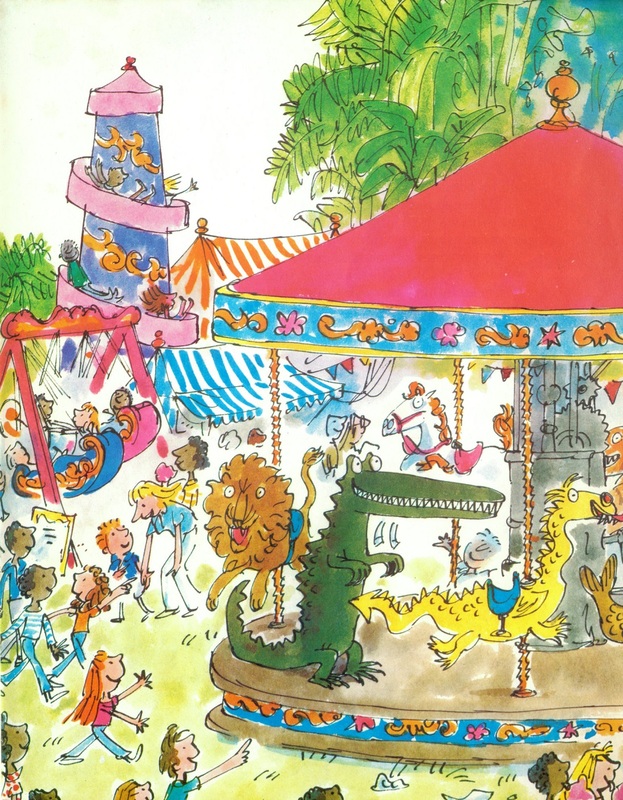 This book was a gift when I was around seven, from my mother who loved it from her own childhood. It’s a romantic, bucolic fantasy, a nostalgic vision of a past England, a wildly funny rumpus, a tale of cross-dressing, of friendship, loyalty and politics, and a book that contains perhaps the most adventurous chapter that a small child could come across in children’s literature. 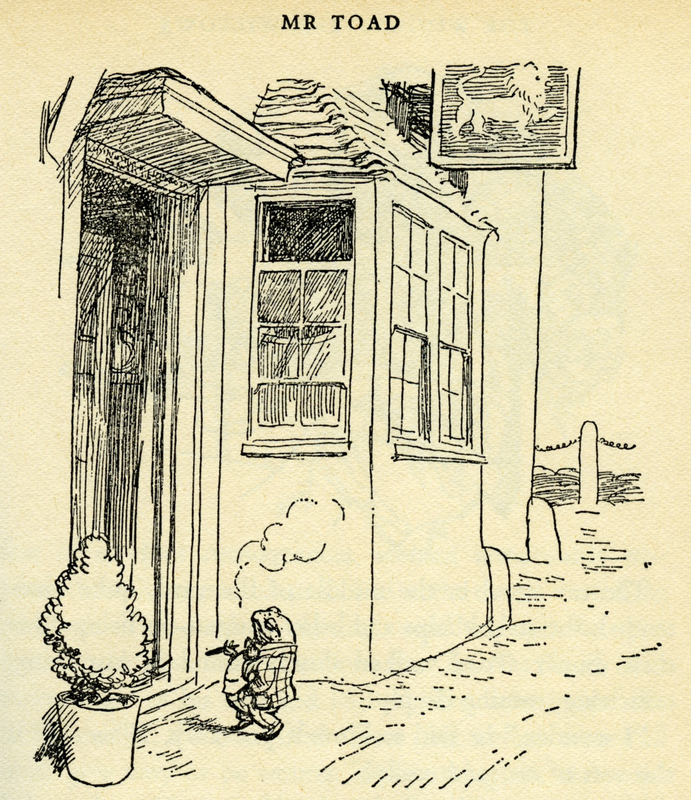 It also contains some of the most evocative drawings, full of character, that I’ve seen between the pages of any book. The Wind in the Willows completely opened the door into the world it created… a door I loved walking through. As a child growing up in the country I felt the same love the author has for the setting… a setting explored in the abstract & supernatural chapter, ‘The Piper at the Gates of Dawn’ (the chapter title was borrowed by Pink Floyd for their first studio album). 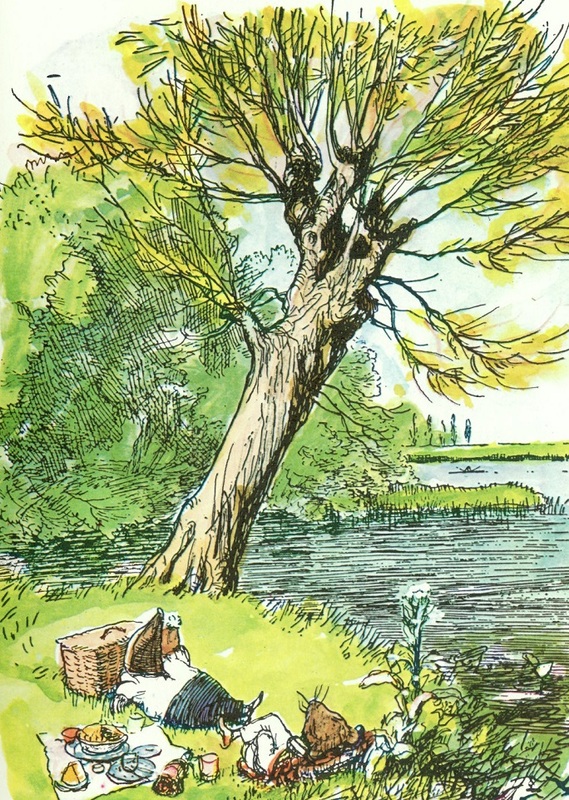 I loved the friendship between the two rather Edwardian characters, Ratty and Mole, and the dawdling nature of their bucolic riverside existence. I loved the absurdity of Toad and his ridiculous antics. It’s a wonderful world, which every child should dip into at some stage. 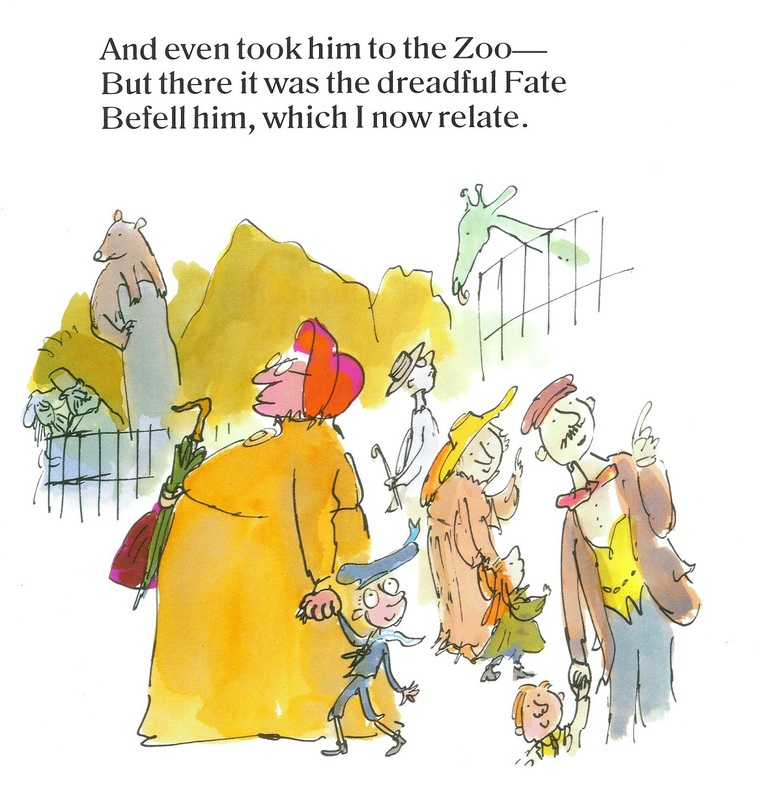 Probably to have the ability to have drawn the actual illustrations for Roald Dahl’s ‘The Enormous Crocodile‘, which were actually drawn by the confoundedly brilliant Quentin Blake… I completely love them… they’re so wildly free and perfectly compliment the dark, anarchic writing. But more than anything, they’re just very, very funny. Deliciously sly and devious behaviour, captured in the expressions. Ah to have that wit! (While we’re at it… and as this is fantasy… I may as well have written it too.) 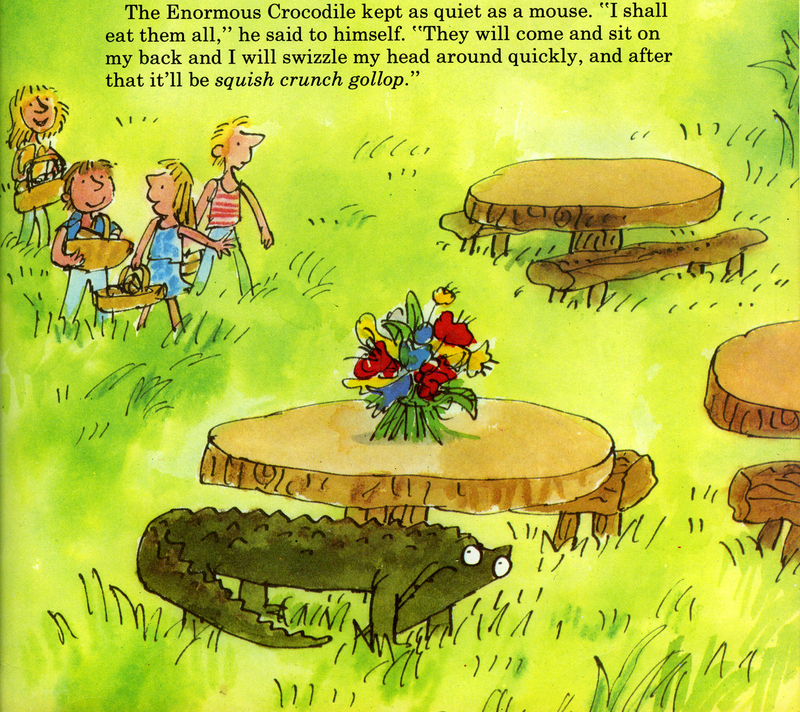 A friend pointed out that a lot of my books seem contain the threat of being gobbled up in them… they wondered why… I blame it on the Enormous Crocodile. I went through a period where I stopped reading books entirely for a few years, and transferred my loyalties to comics. If you were growing up in a northern village in the 80s there was only one comic to read, obviously… 2000AD. Comprising Judge Dredd, Torquemada, Rogue Trooper, Slaine, Robo Hunter. I loved the stories and the worlds conjured up… but I loved most the drawings… identifying each artist’s distinctive line. Brian Bolland’s beautiful clean line for Judge Dredd (above). Carlos Ezquerra’s loose chunky work for Rogue Trooper & JD. Kevin O’Neill’s amazing drawings for Nemesis. Mike McMahon’s abstract art for the Fink Brothers (below). All of that led to the discovery of brilliant French comic artists like Moebius, and work that went deeper and was aimed way beyond the teenage market. Then to NY comics like RAW and Art Speigelman’s brilliant ‘Maus‘ books. I still occasionally dip into that world… the last I remember being amazed by was a French comic called ‘Polina‘ by Bastien Vives. Possibly Middlemarch, but everyone says that… Am I allowed to count ‘Songlines‘ by Bruce Chatwin as a classic? I read it only a year or so ago but what he writes about in it has really been swimming around my mind on a fairly regular basis. It’s a book about Nomadisim, and our deeply rooted need to travel. The first part of the book follows him to Australia where he wants to learn about the songlines of the aboriginies. The routes that they still walk, which were originally walked by their ancesters as they looked around them and sang the world into creation. The second half of the book is a collation of his own and others writings on nomadism. A way of life we lived for hundreds of thousands of years, until the agrarian revolution a comparatively short time ago. Basically, I love the way he’s makes the point that so much of the way we’re fundamentally wired stems from the times we were walking across the plains. There are two answers to this. The last book you’ve made can often be a favourite (once you’ve got over thinking it’s a less than feeble effort that shouldn’t see the light of day), and so ‘Max at Night’ is that book right now. It’s follows on from ‘Max the Brave’. This book is a much more poetic, bedtime read. I loved writing it, and particularly loved making the artwork, which has much more of a sense of place… a city at night kind of a space. 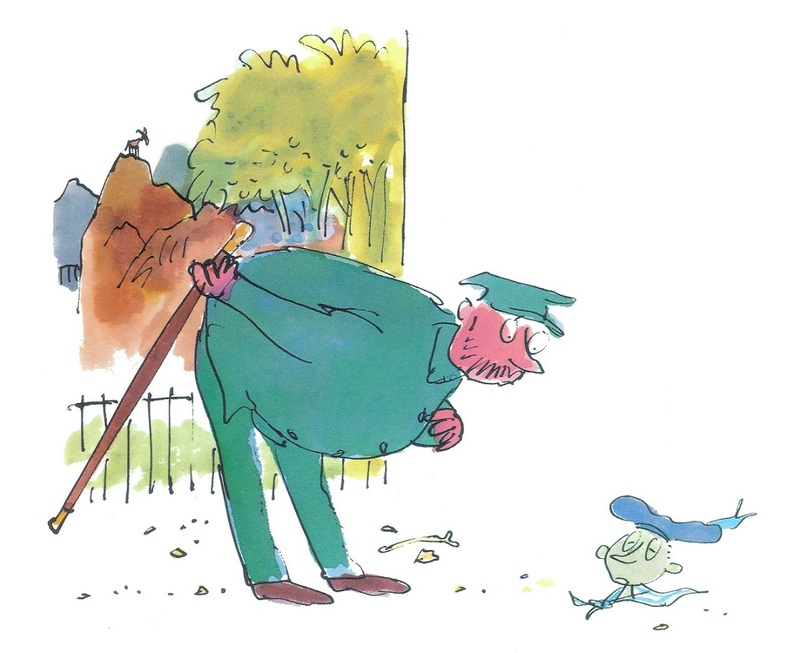 My real favourite though is Mr Big, I’ve read it so often and I always love seeing the way children respond to Mr Big‘s plight… with sympathy and often love… it’s very humbling. I’ve also really enjoyed the different roads it’s opened up, performing it on stage, me live drawing, alongside the incredible ‘Neil Cowley Trio‘ who play blisteringly good jazz and bring the book to life beautifully. I’ve also performed it with the Britten Sinfonia a few times which was pretty special. 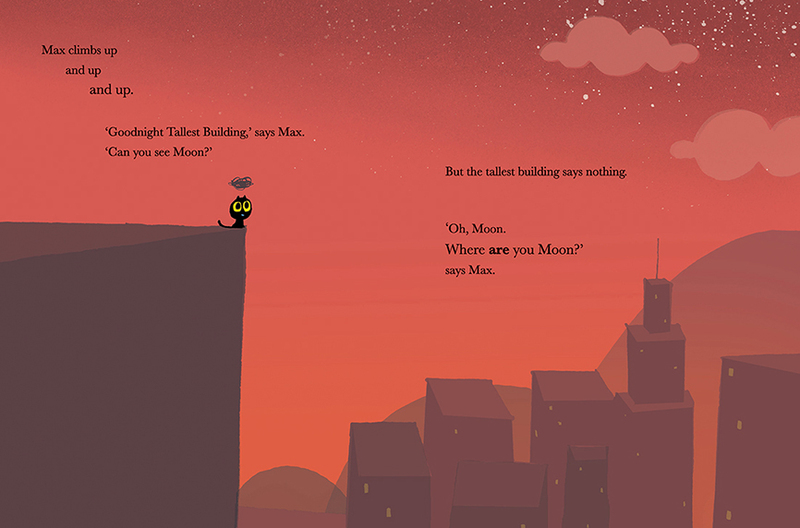 Max at Night is published by Puffin. Tags: 2000ad, Banana, Brian Bolland, Bruce Chatwin, Ed Vere, Hilaire Belloc, Judge Dredd, Max at NIght, Max the Brave, Mike McMahon, Mr. Big, Quentin Blake, Roald Dahl, Songlines, The Enormous Crocodile, Wind in the Willows. Bookmark the permalink.